Entertainment Geekly: Do the what now? But the lineage of Bond is mad. Mad, I tell you. Gadgets and rockets, henchmen übermenschen and oversexed geopolitics. Part of the fun of loving Bond is loving the tension between narrative poles: The urge toward something like reality and the simultaneous urge far, far away. For a long time, my favorite Bond movie was You Only Live Twice, a monument to Pop Art set design and space-age paranoia and transformer helicopters and ninjas. Like every film in the franchise, You Only Live Twice is indefensible as a social document: Sean Connery goes undercover as “Asian Male,” and freely swaps one partner-lover for another one. And if you’re looking for everything “gritty realism” isn’t, “Volcano Rocket Base” is it. The Daniel Craig Bonds never weren’t a little crazy. We talk a lot about how Craig made Bond “real,” how these movies gave Bond a “past.” But Casino Royale has a funky side: Bond kills a man in the middle of the corpse-chic Bodies exhibit. That funk’s all gone in Quantum of Solace, a movie so completely unloved that it’s probably overdue for reconsideration. I find it mostly unwatchable, a grimdark exercise in anti-joy. 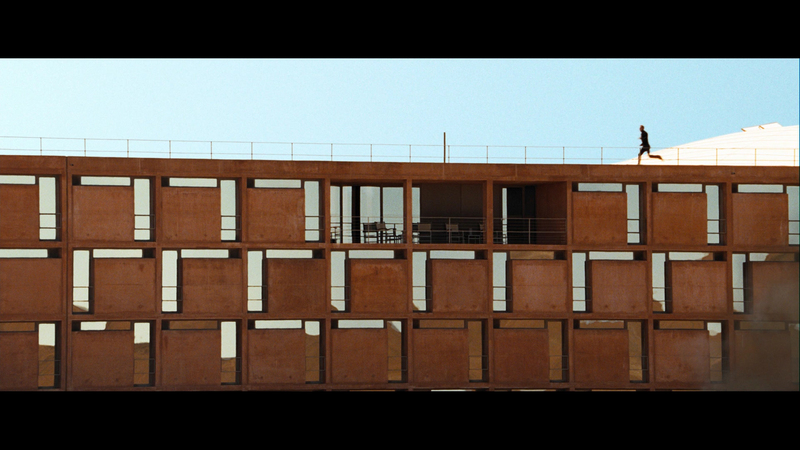 The last big scene in Quantum goes to a chic hotel with, WOW, a lot of squares on the outside! Squares! How chic! How minimal! How… square. People don’t love Spectre. Chris Nashawaty gave it a B-minus, which is on the generous side. Last year, the film writer Film Crit Hulk wrote a towering essay-book-blog about the 007 series. (Read it all today, please.) One of his central big ideas is that the Bond franchise suffers from a self-afflicted case of Terminal Overreaction. Every Bond film is, in part, a portrait of the producers freaking out about the reaction to the last Bond film. You certainly get that sense from Spectre, which takes everything that was apparently good about Skyfall — and all the bad things that were too small to notice — and magnifies them. But the Bond franchise is also a case study in zeitgeist overreaction. Part of the pleasures of loving Bond is how the franchise provides a pocket history of half a century of the blockbuster-movie as an art form and as an ongoing concern. You watch the ’70s become the ’80s around the outskirts of the Moore Bonds. You watch film styles come, go, return. You need to excavate a little. A View to a Kill is an incredible Grace Jones delivery system, if you can wade through an hour of equestrian noir. You need to always remember that the geopolitics of the James Bond franchise is a load of hot nonsense. The Brosnan Bonds tell you nothing about the realities of the ’90s: The period when the Cold War quietly, gradually, suddenly shifted into the War on Terror. But the Brosnan Bonds tell you everything about our weird paranoid fantasies in the ’90s: media moguls and renegade Russians and the corporate-terrorist complex. So Spectre is an overreaction to our current blockbuster moment. Like Quantum, it wants to be a serialized sequel. Like every superhero film, it wants to prove itself as a Saga. This is very silly, for the most part. SPOILERS FROM HERE. It is silly that James Bond was a childhood friend-brother to Franz Oberhauser a.k.a. Blofeld, and it’s silly that Oberhauser killed his father and faked his own death and changed his name to Blofeld and became the most evil man alive. Nothing that happens in Spectre holds up to even minor logical scrutiny. (Bond sets off on his mission because M leaves him a video with, basically, this instruction: “Kill this random guy and go to his funeral.”) The logic stuff wouldn’t matter in a lighthearted movie, but Spectre keeps filtering in psychodrama and Snowden-era paranoia. It’s like watching an episode of DuckTales about the financial crisis. But I come not to bury Spectre, but to weirdly praise it. Because the final act of the movie is so strange, so willfully obtuse, that it deserves extra attention. Put simply: I have no clear idea what happens in the last half hour of Spectre. I’m not sure anyone really does. It’s a final act that feels overly rewritten in four or five different directions. I guess you could just say it’s “bad.” It is radically unpleasant in the context of Bond movie history — and it dovetails on some bits of fan service so shameless that it’s shocking they didn’t just throw in Benedict Cumberbatch with robotic hands and a doctor’s outfit. To recap: Bond and Madeleine Swann are on a train to the middle of nowhere, because they found a map pointing them there. On the train, Bond and Swann bond over drinks, and then really bond after they rescue each other from Hinx — a henchman who deserves his own return trip, like when Jaws got a girlfriend in Moonraker. They arrive in a desert. A car picks them up, and brings them to Villain’s Lair. The design feels like a You Only Live Twice callback: a top-secret HQ in the hole at the center of a mountain. In this case, the range is actually a meteor crater. We learn this, because Christoph Waltz’s big baddie welcomes Bond and Swann into a dark planetarium room with a gigantic meteorite at the center. Oberhauser and Bond talk about the meteorite hitting Earth, but they’re really talking about each other. At no point in any of this does Bond have a plan. At no point in any of this do Bond or Oberhauser talk about their shared history — and at no point does Spectre acknowledge the fundamental weirdness of two childhood frenemies becoming world-destroying espionage superhumans. Instead, Oberhauser puts Bond into a brain drill. He tells Bond that his new name is Blofeld — something that doesn’t matter at all to anyone — and then he starts drilling. This is where things get a bit weird. And by “weird,” I do at least partially mean “nonsensical.” Based on a straw poll of my EW colleagues, the consensus is that all Blofeld is doing in this scene is torturing Bond: The “brain drill” is just designed to drill his nerve endings, make him feel tremendous pain. But at one point, Blofeld starts saying some very strange things. He talks about how, if his weird little brain drill hits just the right part of Bond’s brain, it will erase his ability to remember faces. He’s talking, specifically, about the faces of the women close to Bond, now and then. Suddenly, everything changes. Bond frees himself from the torture contraption — using, um, his strength. He gives Madeleine his exploding watch, and tells her to throw it. A long time passes. Blofeld looks confused. Madeleine throws the watch right at him, and it explodes, engulfing him in flames. Bond grabs Madeleine, and runs outside, and kills everyone. But the way he kills everyone is strange. The Craig films tend to shoot action sequences with an eye toward cover tactics — think Jason Bourne, or Gears of War. But as Bond exits the Spectre headquarters, he just keeps on walking right into the middle of enemy fire, and shooting people with a machine gun. Bond and Madeleine get up to the helipad, and the entire base explodes behind them. It’s a shot that recalls Schwarzenegger kissing Jamie Lee Curtis in True Lies, with a nuke going off in the background. Or is that the Schwarzenegger movie we should be thinking of? Suddenly, Bond is back in London, where he rejoins his squad of friend-partners M, Moneypenny, and Q. Off the top of my head, it’s hard to think of any scenes in the entire James Bond franchise where all three of those characters were together; certainly, they were never united together as Bond’s back-up A-Team. But that’s what happens here. The supporting cast goes off to stop the Intelligence Complex from becoming what the CIA already became a decade ago. Meanwhile, Bond says goodbye to Madeleine: She sees that he will never change, and she cannot go back to the life of espionage (her father was a member of Spectre before his suicide). But she tells him this, crucially, while they are in the middle of a mission. I guess you could argue that at this point in the movie, Spectre seems to be destroyed — but it’s a weird moment, right before the world gets saved, to announce that the relationship just won’t work. Madeline gets captured. Bond gets captured, too, but that doesn’t last: Twice in the last half-hour of Spectre, Bond just frees himself using the power of human strength. He walks into the ruined MI6 building, sees posters of all his dead enemies, his dead lover, his dead mother figure. He finds Blofeld, his left eye scarred. (This is meant to be a reference to Blofeld in You Only Live Twice, but for this Bond, it feels more like a callback to Le Chiffre, whose scarred right eye cried blood.) Blofeld tells Bond that a bomb will destroy the building, and Madeleine is somewhere inside. He has three minutes. And then Bond runs through the building. Webster’s defines a building as: “a structure (such as a house, hospital, school, etc.) with a roof and walls that is used as a place for people to live, work, do activities, store things, etc.” The MI6 building is a very large building, with multiple floors. Bond runs upstairs several flights, takes a second to look at Bloeld’s helicopter, and then just finds Madeleine. They escape on a boat as the building explodes. Then he shoots Blofeld’s helicopter down with a pistol. Then he finds Blofeld on a bridge. M watches from one side of the bridge; Madeleine watches from the other side. Bond doesn’t kill Blofeld. He goes away with Madeleine. And then — the next day, two days later, a week later, a month — he goes back to Q branch and asks his old pal if he can borrow the car. And then he goes away with Madeleine, again. Here’s question: Why is any of this happening? Here’s an answer: It’s all in Bond’s head. Because he is dying on Blofeld’s operating table. Roll with me on this for a second. When Blofeld is torturing Bond, he mentions an earlier part of the movie, when Hinx killed a man like the Mountain killed the Red Viper. He talks about the moment before the man died, when he was still breathing — but he was also not there anymore. So then Blofeld starts digging his little contraption into Bond’s head. I guess maybe he’s just touching nerve endings, maybe? That’s not what it looks like, and it’s also not what Blofeld’s stated purpose is. And is it just a coincidence that — right as the torture is at its most extreme — Madeleine suddenly tells Bond that she loves him? Just a coincidence that, right after that happens, Bond executes an escape that requires logical leaps totally absent from the past few movies: a talking killer who doesn’t notice his prisoner escaping from poorly tied wrist-straps, a top-secret facility rigged to explode in one big chain reaction? I know, I know: The obvious answer is that Spectre has a poorly conceived third act, rewritten into obscurity, struggling to balance the divergent necessities of retconning the past four movies into a saga and ending a saga and making some weird point about Bond’s job not letting him ever get close to anyone and letting Bond pull a Dark Knight Rises to run away with his climactic love interest. But I don’t just conjure up my Brazil theory of Spectre as a lark. Every actor who has ever played James Bond has left the character unexpectedly. Connery knew he was leaving Bond, but then he came back twice. Moore played Bond forever, and then one day all involved decided he was finished. Dalton and Brosnan were ready for more. Lazenby seemed good either way. And yet, their final moments as the character have odd, accidental resonance. At the end of A View to a Kill, Moore’s 007 receives the Order of Lenin from the Russians: a symbolic end to the Cold War, years early. Licence to Kill wraps up with Dalton’s Bond playfully ensconced with Carey Lowell: an oddly perfect pairing. (It’s the happier-ending alternate universe to Lazenby’s farewell scene, mourning his dead wife — and, implicitly, a long life ahead of endless unsatisfying womanizing.) Brosnan’s Die Another Day ending is the hyperbolized version of Dalton’s: He’s paired up with another badass partner-lover, except this time they’re covered in diamonds. At the end of Never Say Never Again, Bond goes to live in the Bahamas. Connery’s still there. Craig: Who knows? Maybe he’ll do another. Maybe that will be a more obvious ending. But is it weird that I prefer to think of Craig’s Bond, lying on that operating table, finally granted some grace in his vision of a more perfect world? Spectre is raging against the dying of a light that’s already dead: When it makes speeches about the overreach of the Intelligence State, it may as well be telling people not to start using social media. Whatever world Craig’s Bond is fighting for is already long gone. So maybe it’s best to leave him there, in a final yearning deathdream, on a final mission from which he knew there was no return. Bond walked in to Blofeld’s lair, eyes wide open. Bond left his own body there, eyes wide shut.